The world learned on March 13 who was elected as the 266th pope of the Roman Catholic Church. 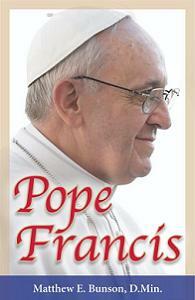 For those who desire to learn more about Pope Francis, the moment is just around the corner. Matthew Bunson, Senior Fellow of the St. Paul Center for Biblical Theology at St. Paul Center for Biblical Theology in Steubenville, Ohio, has written the first English-language biography on Pope Francis. The book’s publisher, Our Sunday Visitor, announced March 22 the book, titled “Pope Francis” ($16.95 USD), will arrive in bookstores on April 10. The book is available for pre-order through Our Sunday Visitor. His reputation as a man of the people who lived simply, cooked his own meals, and rode the bus. With its research conducted in five different languages into the lives and ministries of the world’s leading Cardinals, their backgrounds, writings and homilies, “Pope Francis” shows why Cardinal Bergoglio was ultimately elected as the Catholic Church’s pope.